As a pet owner, it’s important to be aware of factors that could create or become health concerns for your pet and then take steps to ensure they’re not in danger. With summer comes all sorts of hazards for dogs and cats, from an increase in the possibility of coming into contact with parasites to poisonous plants and problems associated with heat, just to name a few. Whether you leave your dogs outside all day while you’re at work or even for just a few hours at a time, it’s critical that you provide them with shade throughout the day. If you don’t have any trees, and for whatever reason you can’t build a DIY sunshade, consider purchasing a portable lanai of sorts. Have a larger dog that weighs more than 100 lbs.? Not a problem. 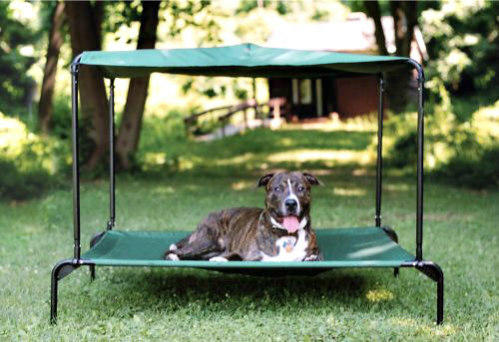 The same maker of the Green Breezy Ultra, Kittywalk Systems, Inc., also makes the Ultra Royale, an outdoor pet hammock with canopy for dogs weighing up to 120 lbs. Both products boast easy, no-tool assembly for quick setup and take down. Because they’re so lightweight, you can easily move them anywhere in your yard. The quick drying, water-resistant fabric also washes easily with a garden hose. Another choice along the same lines comes from K&H Manufacturing. 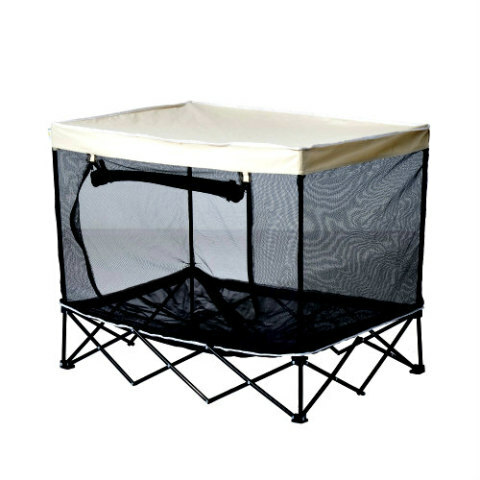 Their Pet Cot Canopies follow the same principal as Kittywalk’s, but in this case they more closely resemble a dome tent, and you have to buy the cot and dome separately. You can choose between sizes small, medium and large for both, and the cots are said to hold dogs up to 150 lbs. The domes generally run under $20, but the cots vary considerably. 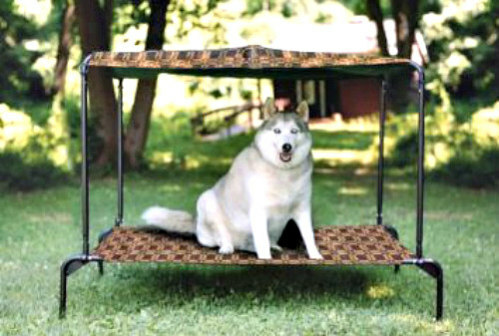 When purchased together, though, depending on the size of the cot, they can still be cheaper than the Kittywalk shade beds, but I can’t attest to equal or lesser quality. Here’s another choice in elevated beds with a sunscreen. 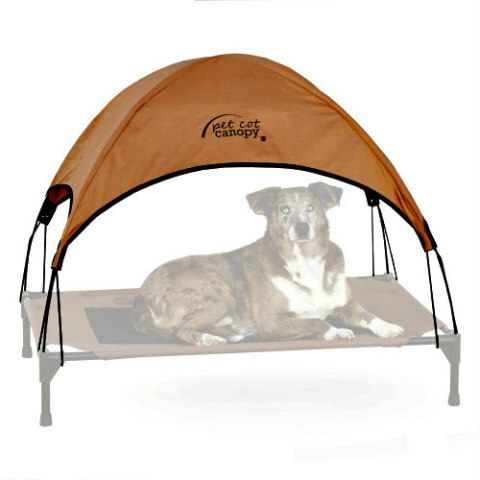 Quik Shade’s covered bed is said to have a sturdy frame that locks into place, ensuring your dog can’t collapse it when jumping on it. The bed is mesh, for even more airflow, and it comes in four different colors. It comes in three sizes and even includes a carrying case, if you want to take it with you camping or out of town. 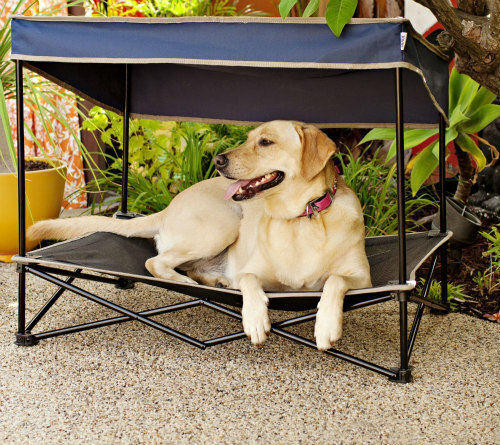 Pawhut’s version of the elevated dog bed with sunshade canopy offers mosquito netting much like the pop-up gazebos you can buy for private use or entertaining. The metal frame is said to easily fold up for convenient storage or travel purposes, and the product includes its own carrying case, too. The Pawhut 40” model weighs merely 11 lbs., but it can hold dogs up to 55 lbs. Any of these dog patios can be combined with an oversized cool mat like the one Hugs Pet Products sells, as long as you’re sure your dogs won’t rip them up and eat them while you’re gone. Remember, besides shade, all creatures outdoors need plenty of fresh, clean drinking water to survive. If your pet has short white fur, apply sunscreen to their skin and nose before letting them play outside. 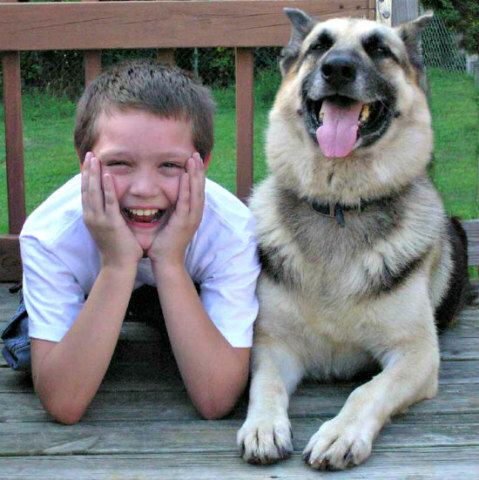 Another good idea is the use of cool vests and harnesses, which can reduce your dog’s temperature when used properly. Most of these require a time limit and supervision while in use, so read and follow the instructions carefully before employing them. Finally, if you’re going to leave a pet outside, consider providing it with a kiddie pool made of hard resin plastic so they can’t pop it but always have access to a quick dip. Having said all that, have a great and safe summer!